Discover its features below, read testimonials from people who have built it, and place your order for plans or a kit. Performance, Speed and a Cabin! The RowCruiser offers comfortable sleeping accommodation for one person without sacrificing performance. 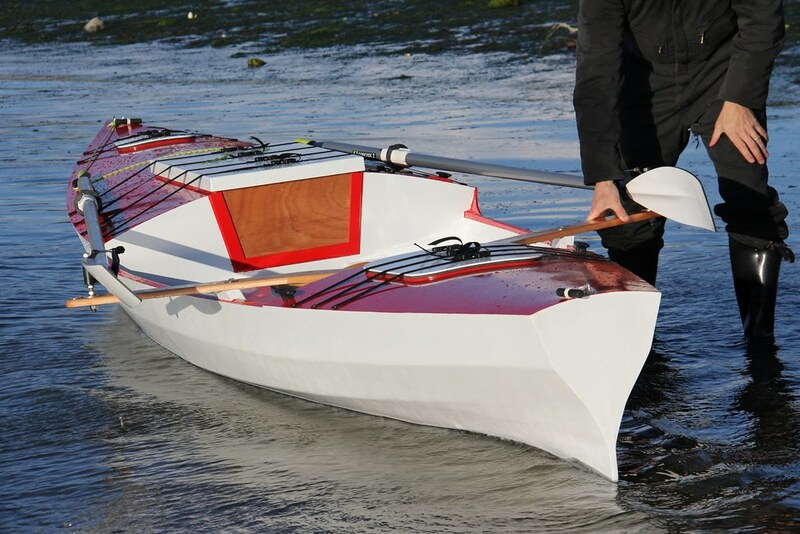 This boat moves at about the same speed as a sea kayak, and will travel comfortably in rougher waters. The RowCruiser makes multi-day excursions extremely simple; drop the anchor and retire into the comfortable cabin when you’re tired. The watertight design protects the occupant from the heaviest of wind and rain, while an over-sized hatch vent provides plenty of ventilation and keeps condensation at bay. For those serious about camping on the water, this setup is much better than a tent over an open boat. When the wind picks up, a tent quickly becomes a liability and is a recipe for a sleepless wet night. The RowCruiser, on the other hand, provides robust accommodation for all conditions. The work of constructing the cabin is also significantly less time consuming than creating a good custom tent. Many of the tent designs we've seen also require going ashore to setup. The RowCruiser cabin provides sheltered space to store gear, and most importantly', offers reserve buoyancy for extreme seaworthiness. One or two passengers can also be accommodated in the cabin for day trips.To read more about tents vs built in cuddy cabins, please visit an article we wrote on the subject. The boat is shaped to combine traditional elegance (including the perfect wineglass transom) with all the attributes required to maximize performance, seaworthiness and comfort. The hull is made from eight panels and the cockpit is shaped to accommodate a standard sliding seat rowing system. Click here to view linesplans. We provide sliding-seat/rigger kits suitable for rowing the Cruising Rowboat. The vessel also works well with a fixed seat rowing system. Instructions/templates for installing the sliding seat system are provided within the Cruiser instructions. Click here to read about our maiden voyage. Click on the image below to view the RowCruiser Photo Gallery. To visit Marty Loken's dedicated site on the RowCruiser, which includes information on RowCruiser workshops, developments, build gallery, forum and more, please visit www.rowcruiser.com. To purchase the RowCruiser plans or kit please click on the red link below. Includes full sized plans and manual. DXF files available for an extra $50. Exclusively retailed by Small Craft Advisor. Includes CNC cut plywood components, study plans, and manual. Find out what other people have to say about their experience building the RowCruiser Rowboat. I have enjoyed the rowcruiser immensely these past few months and have had the opportunity to test it out in a variety of conditions. It performs wonderfully. Last weekend my wife and I loaded it up with camping gear and headed off to an island just off the coast. We started early hoping that the wind would not have kicked in but it had. We had wind and swell on our beam but the rowcruiser remained stable, simply rising up and down with the swell and still making great headway. The weight of the gear and my wife was not a problem. I have a webpage that is a bit like a digital version of a scrapbook. It can be found at rowcruiser.strikingly.com. I have a few details to still do but I got it on the water Sunday and it handled nicely. Both my hatches have a screen cover for ventilation when sleeping, haven't tried that out yet. I will be testing on Lake Erie and planning a trip down parts of the Ohio river over Labor day. Thanks for your help. I'm very happy with the boat kit, the parts fit like a glove and I've never enjoyed building anything as much as this boat! Wow! Had the boat out on a friends pond last night and am so impressed. Even with heavy 10ft raft oars is was awesome. Really like the glide of the boat. Spent the night out in it. I could see pontoons being a nice touch for anchorages. I finished the boat, stored it in the barn and left on a bike tour of the Canadian Maritimes the next day. I plan to start rowing around the end of July.. I tentatively plan on being in Alaskan waters next summer with the boat.